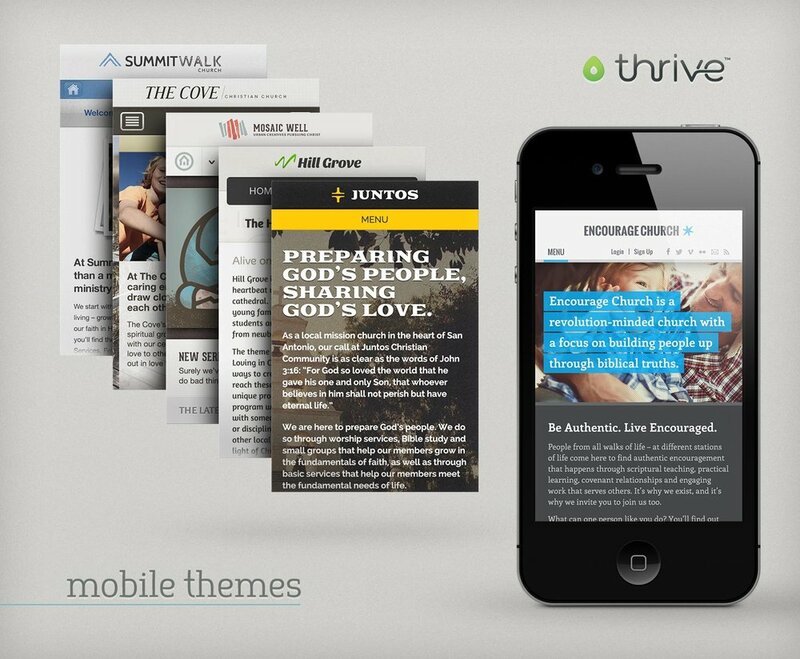 Thrive is an all-in-one publishing platform for churches. The goal of Thrive is to help churches maintain a consistent, branded voice while supplying the tools to communicate in a lot of different ways. Thrive was developed as a higher-end product to its forerunner, E-zekiel, which was essentially a collection of pre-designed web templates paired with a very basic back-end content management system (CMS) that customers could employ to get a website up quickly. Taking that idea a step further, Thrive offers its users a themed approach to branding and communications, with each theme including a collection of branded digital and print materials that can be used to reach audiences across multiple media channels. 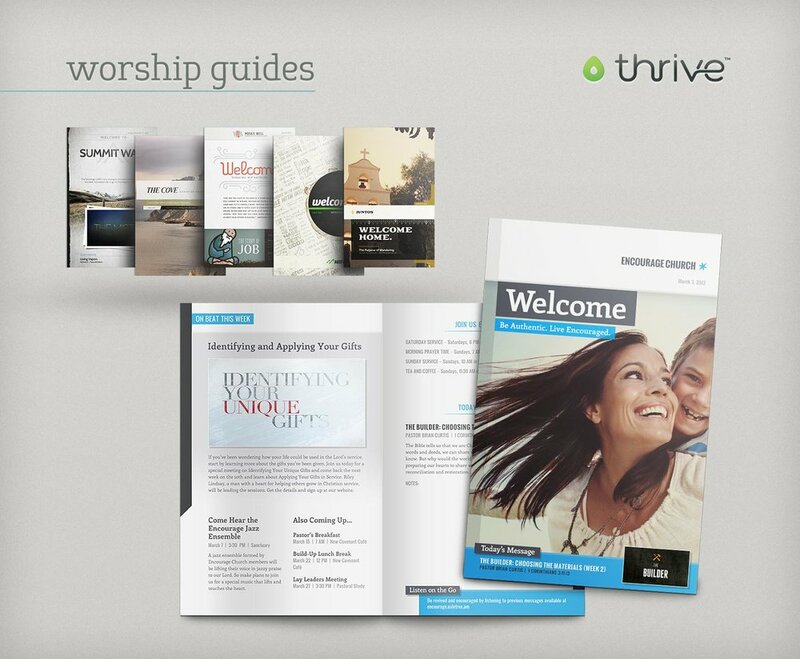 In short, Thrive provides churches with limited budgets and resources access to a cohesive brand identity and the means to communicate effectively, all from one centralized hub. I partnered with Axletree Media to conceptualize and develop an enduring product logo that illustrates the fluid connectivity of using the application and points to the potential of growing your organization's brand. 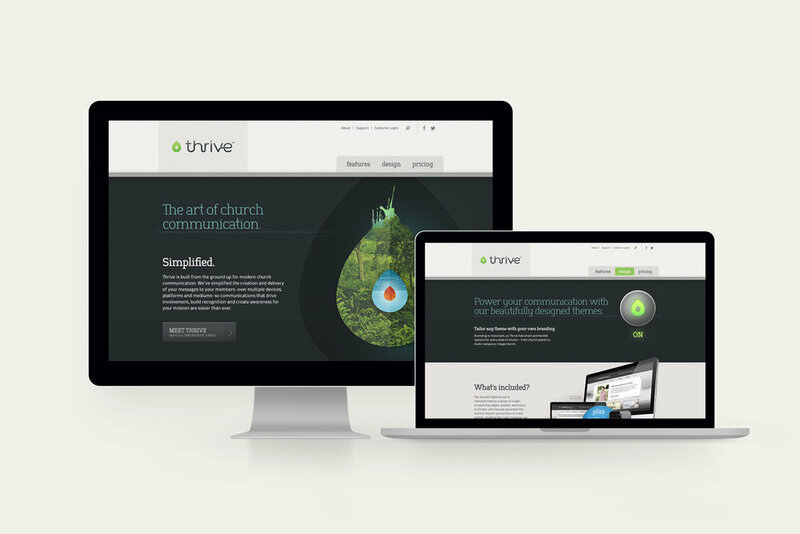 In addition to the product itself, a concept was in the works to simultaneously create a customer resource site called Hive where Thrive users could search for and read up on church communications best practices. Playing off of the Thrive icon shape, I designed a fitting companion logo to brand the Hive website. Along with the logo designs, Axletree commissioned me to design a series of three illustrated diagrams which were used to introduce the Thrive platform and a proprietary six-step method for Thrive users to achieve momentum in growing their communication strategies. The finished illustrations set the stage for designing a pre-launch landing page and, ultimately, the first iteration of the full storefront website. The Thrive site was designed to give a quick overview of the product, showcase its features, and provide an easy path for customers to purchase a subscription plan. I was also given the opportunity to complete the initial designs for the Hive resource site, but, unfortunately, this portion of the project never saw further development. Prior to developing the brand and web identity for Thrive, I spent more than a year working with Axletree to develop the first set of branded themes for Thrive. Each branded theme included a simple logomark, responsive website template, email newsletter template, worship guide, guest brochure, and corporate business set.